Books, like people, are a random lot. In any given year, you can meets lots of perfectly nice books, but there are a certain few that just crawl into your heart and make a little home for themselves. Being the thoughtful person that I am, I’ve rather helpfully compiled a shortlist (because ain’t nobody got time for long ones!) of the books that really struck a chord with me this year. Four 5 star reviews and one 4.5 star review of five very different books (try saying that after a few Baileys hot chocolates!). We’ve got a girl who lives in the woods, a woman who speaks to squirrels (pattern?! ), the family reunion from hell, an amateur detective with a fear of turning left and finally, a talking canvas. It’s an eclectic mix, I’ll grant you, but one thing they all share is fantastic writing by extremely talented story tellers. Enjoy! This book came as such a surprise. I’m a sucker for a pretty cover and added it to my list without really reading the blurb. I’m so glad I didn’t – it’s a refreshing change to come to an original story like this without any preconceptions. I instantly fell in love with Punzel (Peggy) and instantly worried about her mother and father’s parenting skills. The cover reminded me of a fairytale (a girl lost in the woods) and this is a fairytale in its traditional sense, warning of the evil lurking in the shadows and the courage of the human spirit to overcome these demons. While it is a dark tale, it is told through the bright and optimistic eyes of a young girl, making the best of things. I think it’s this wonderfully innocent perspective that makes the story so compelling. Fuller’s touch is subtle, yet infinitely more striking for it. She’s such a talented writer and it was a joy to lose myself in her prose. This is one of those books that stays with you for a long time after and you feel compelled to talk to other people about it. That, in my eyes, makes for the perfect story and that is why I’m giving this book 5 stars. Highly recommended. I flippin’ loved this book!! And it’s inspired a kind of protectiveness in me that means, if you don’t like this book, we can’t be friends. As promised in the blurb, it is a big-hearted, laugh out loud story that begins with the simple premise of boy-meets-girl, which only belies the complex journey that lies ahead. Veblen is named after Thorstein Veblen, the American economist and socialist, who (according to wiki) was a witty critic of capitalism. Veblen’s life is completely inspired by his teachings of ‘conspicious consumption’ explored in his book ‘The Theory of The Leisure Classes’. I had never heard of Thorstein and discovering him is one of the highlights of this book. Whether or not you have an interest in economics, McKenzie explores the issues of status and consumerism expertly through the lens of family, relationships and the ego’s quest to conform and conquer. The characters are so well fleshed out and true to their own natures that I would hardly question their existence. Both Paul and Veblen’s dysfunctional families provide the perfect backdrop to a story of self-discovery and self-determination. Packed with philosophical observations and moving introspection, it’s no surprise that this novel was short-listed for the Baileys Prize. Witty, intelligent, with a good dollop of quirkiness thrown in, this is a truly original novel that thoroughly deserves five stars. Wow. You often hear people say ‘I could listen to her sing the phonebook’. Well I could read Anne Enright’s fictionalised version of it! This novel reads effortlessly (which obviously means a ridiculous amount of work has gone into it) and I didn’t want it to end. The Madigans are like a sitcom that could just continue on and on, with their daily squabbles and trivial decisions. Which, of course end up being monumental ones. Yet they are so real to me, I feel that I could drive down to Clare and pop into them for a cup of tea. Well, maybe not to Rosaleen, I wasn’t too fond of her. But that was the point. She was the cloying Irish mother that could not let her children go; could not let them be happy. And this novel is about each of their respective efforts to escape. It’s another one of those novels where nothing happens and yet everything happens. Whole lives happen, in their dull, predictable yet entirely complex and intriguing way. Enright’s style is searingly honest – which I suppose is what every great writer strives for… truth. And it is up to us, the reader, to find the beauty in that truth. In characters that are so helplessly flawed and hopefully trying to be better versions of themselves, trying to live better versions of their lives. Brilliant. Why have I left it so long since reading Colin Bateman? I suppose, you have to give other authors a chance, but coming back to this book only reaffirmed what I already knew – nobody does it better! His unique brand of irreverent humour coupled with his ability to create the most unlikely heroes in the most bizarre circumstances is second to none. Our man, who shall not be named, is interested in two things: selling crime fiction in his bookshop ‘No Alibis’ and Alison, the shop assistant who works across the road. But when the detective agency next door closes down and people start bringing their problems into his shop, our man uses everything he has learned from his back catalogue of crime novels to crack their cases. Despite his hyponchondria and a myriad of phobias including a fear of turning left, our hero proves himself to be quite the detective. With little help from his assistant Jeff, who spends most of his time working for ‘that shower of whingers at Amnesty International’, our man solves several hard-hitting crimes, including The Case Of Mrs Geary’s Leather Trousers. But it is Alison who really brings our hero to life. I love how Bateman writes his female characters; courageous, witty and smart. Their budding romance, which again seems so unlikely that you can’t help rooting for it, gives this story its heart and reveals our man at his most vulnerable. Needless to say, the story takes lots of entertaining twists and turns, involving murder, mayhem and Nazis. And a book launch! Only someone who has mastered his craft can make it look so easy. What I love about Bateman’s books is that they don’t take themselves too seriously, but they are seriously good books. Highly recommended for anyone who likes their humour on the darker side. Wow, this novel has everything but the kitchen sink! (Actually, no, there is a kitchen sink in there too). What begins as a simple story about a woman nursing a broken heart, turns into a comedy caper that takes us on a journey through the world of art, food and rather improbably, love. 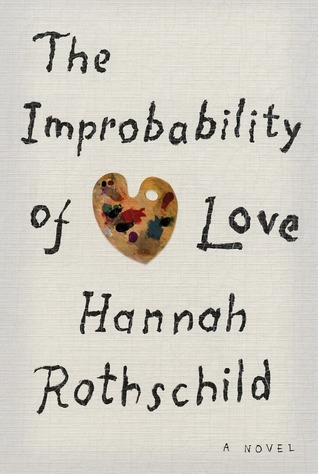 Hannah Rothschild is simply the queen of character development and while it did at times feel as though the world and it’s wife were featured in this story, it didn’t detract from its brilliance. I can only guess at the amount of research that was gobbled up in the making of this novel, which is such a gift for the reader, as not only are we being entertained, we’re being informed. As a self-taught artist who lives a billion light years away from the auction rooms of Europe, it was fascinating to eavesdrop on the goings on behind the big price tags and even bigger egos. This novel questions the true value of art and one of the characters even admits that he knows the price of everything and the value of nothing. What makes a painting so desirable? In the end, it comes down to our own human nature; the desire to acquire valuable items in the erroneous belief that we will somehow be worth more ourselves. What’s that? You’d like to know where you can get your hands on MY books? How thoughtful of you! How Long Does It Take To Write A Bestseller?